5000249 Boba Fett Minifigure Clock is a Star Wars LEGO Time set released in 2011. The set includes a clock similar to Boba Fett. 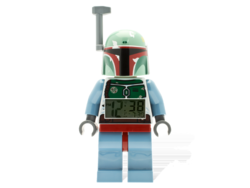 Facts about "5000249 Boba Fett Minifigure Clock"
This page was last edited on 9 January 2016, at 18:43.